Ivan Mosjoukine, Betty Amann, and Lil Dagover directed by Alexandre Volkoff in a Tolstoy adaptation? Who do I have to kill? No one, as it turns out. This is the cast and director of The White Devil, one of the last major silent films to be produced in Germany. Home Media Availability: Never released on DVD or Blu-ray. There is a low-resolution version available for download from archive.org. I will also be covering the 1959 talkie remake, The White Warrior, a sword and sandal flick starring the mighty Steve Reeves. Click here to skip to the talkie. By 1930, the art of the silent film was dead in Hollywood. With Charlie Chaplin as the lone holdout, movies were all singing, all dancing, all talking. In the rest of the world, silent film clung on a little bit longer. Switching to sound was expensive and challenging but the public demanded the talkies. Germany’s film industry had survived a devastating war, economic turmoil and its best talent being swiped by Hollywood. The famous Ufa studio was being wired for sound and soon Marlene Dietrich would sing but silent film did not go out with a whimper. Ufa’s late silents show innovation and brilliance. Silent film as a popular art was doomed but it made the most of the time it had left. What makes this film particularly significant is that it was a reunion for one of the most talented director-actor screen teams of the silent era. Director Alexandre Volkoff and actor Ivan Mosjoukine first worked together in Russia but it was their work in France that won international acclaim. Their collaborations included The House of Mystery (1923), Kean (1924) and Casanova (1927), each film considered a masterpiece of its genre. Readers of this site will know how I feel about Ivan Mosjoukine (strongly) but here is a very brief introduction for any newcomers: Mosjoukine was only six years old when representatives of the Lumière film company put on a show of brief actualities for astonished Russian audiences in 1896. Mosjoukine in one of his earliest surviving film appearances. The Russian film industry had a slow, painful birth and it was years before Russian people began to see narrative movies made in their own country. Mosjoukine, by this time in his early twenties, was one of the first major stars of the new Russian cinema. He instinctively knew how to play before the camera and his ability to layer complex emotions and convey them in a single glance (helped along by his intense blue eyes) made him one of the most formidable performers of his generation. Mosjoukine in Michael Strogoff. Ever wonder about my favorite silent movie? This is it. Mosjoukine, along with a good portion of the country’s film industry, fled the Russian Revolution and ended up in Paris. The émigrés soon set up shop and were producing pictures of astounding innovation and artistry. The Russians were able to make films that pleased both critics and popular audiences. Quite a feat, I’m sure you will agree. Hollywood took notice of this and imported a few of the Russians but had no idea how to work with them. Poor Ivan Mosjoukine made the fatal error of signing on with Universal, which cast him in Surrender (1927), a truly dire romantic soaper, opposite the notoriously wooden Mary Philbin. The film wasn’t a box office bomb but it was an artistic disaster. Mosjoukine with his American producer, director and leading lady. They’re smiling now. The movie hasn’t opened yet. If this had occurred a year or two before, the damage to Mosjoukine’s career may not have been as calamitous but there was a new problem on the horizon: sound. In silence, the Russian performers could play anything and anyone. In sound, their accents had to be explained. They had to adapt or return to Russia. Considering that the coming of sound coincided with Joseph Stalin’s increasingly dangerous cult of personality and his mass purges, the latter option did not seem healthy. Losing career momentum at this stage was a serious problem but Mosjoukine made the best of the situation. He finally settled in Germany and signed on with Ufa, where he continued to make films in the waning art of silence. He also reunited with Alexandre Volkoff. And this is where we bring in The White Devil, the final silent film of both Mosjoukine and Volkoff. A colorful Spanish poster for the film. Russian literature remains a fertile source for movie plots and the works of Chekhov, Dostoevsky and Tolstoy constantly find their way onto the screen. For their reunion, Mosjoukine and Volkoff chose Tolstoy’s final novella, Hadji Murat. (This review is truly full of finales, isn’t it?) The choice was a sound one on paper. Both actor and director were most at home in flamboyant costume dramas anchored to solid plots and characterization. Renamed The White Devil (Der weiße Teufel) for the screen, Hadji Murat concerns the culture clash that occurs when a warrior of the Caucasus Mountains attempts to negotiate with invading Russian forces. Just to get our bearings. The Caucasus has long been a disputed region and the violent, tragic history of Chechnya and Dagestan did not start with terrorism at the Boston Marathon, the Beslan hostage crisis, the Russian apartment bombings or the First or Second Chechen Wars. Near the end of his life, Leo Tolstoy was reminded of the Caucasian War (1817-1864), in which the Russian Empire annexed the Northern Caucasus (that is, Chechnya and Dagestan) and set off a chain of events that the entire world is still dealing with. French poster for the film. In Tolstoy’s case, he attempted to pick a Tartar thistle for his bouquet but the plant refused to surrender its flower so easily. After struggling with the unexpectedly tough plant, Tolstoy managed to remove the flower but completely destroyed it in the process. Later, Tolstoy saw the same variety of flower in a plowed field. It had been battered and trampled but it still survived, bruised and battered though it was. This staunch refusal to die without a fight brought to mind the warlord Hadji Murat. Bloody but unbowed, etc. etc. etc. The story of Hadji Murat consumed Tolstoy’s final years. He wrote to witnesses who had met the man and begged for details that would give his story life. He referred to Murat’s memoirs and his own memories of life as a soldier. At Tolstoy’s own request, the slim novella that resulted was published posthumously. On to the movie, kids! Note: The intertitles of this film use the Germanized spelling for cast and crew. (Schamil for Shamil, Hadschi for Hadji, Jwan Mosjukin for Ivan Mosjoukine, etc.) To minimize confusion when discussing the differences between the book and film, I have opted to only use the spellings that are most commonly used in the English speaking world. The film opens with Hadji Murat (Ivan Mosjoukine) returning to his village. He is a fierce warrior, feared by the invading Russians and called “The White Devil” because of his distinct white clothing and horse. (You don’t want to know what they spend on dry cleaning.) A widower, he lives with his young son, Yusuf (Kenneth Rive). Hadji Murat has promised Yusuf that he will bring him a new mother soon. Show some patience, kid. Do you think new mothers grow on trees? And hoping to fill that role is Sarai (Betty Amann, last seen under six pounds of false eyelashes in Asphalt). She’s the niece of Imam Shamil (Acho Chakatouny, last seen helping burn out Mosjoukine’s eyes in Michael Strogoff), the leader of the armed resistance against the Russians. Sarai displays her best dance moves but Hadji Murat is stubbornly uninterested. This doesn’t sit very well with either Sarai or Shamil but then Sarai is carried off in a Russian raid and that’s the end of that. As revenge for the raid, Hadji Murat leads an attack of his own and manages to take a large party of Russian soldiers prisoner. Shamil wants to execute them, Hadji Murat refuses and this is where the simmering hostility between the men boils over. Shamil orders Hadji Murat arrested but our hero has other ideas. He escapes with a handful of his men. I’m totally joining your side. Don’t I look thrilled? Hadji Murat is in a pickle. He’s an outcast, he didn’t have time to rescue his son and Shamil has sent warriors to hunt him down. There is only one option left. He will go over to the Russians, pretend to join their cause, use them to destroy Shamil and then strike them down from the inside. The Russians are excited but wary to have the White Devil offer his sword to their cause. Unsure of how to proceed, they send Hadji Murat to St. Petersburg to meet with Czar Nicholas I. This is a major departure from the novella, which took place entirely in and around Tiflis, present day Tbilisi, Georgia. It’s also one of the major missteps in the screenplay adaptation. More on that in a bit. Nicholas has both a czarina and a mistress, Varvara Nelidova (Lil Dagover, who played Jane in The Cabinet of Dr. Caligari). Like everyone else, Nelidova is taken with the picturesque Hadji Murat but there is another denizen of the Caucasus who has her worried. Lil Dagover is a delight. After Sarai (remember her?) was taken by the Russians, she was delivered to St. Petersburg and allowed to join the royal ballet. Um, okay. Is this standard operating procedure for Russians? Do they do this with all Chechens or just the girls? How did Sarai get good enough at ballet to perform before royalty in just a few months? What the heck? See, this is why the action should have stayed in Tiflis. Then we wouldn’t have had to jump through silly narrative hoops to keep Sarai in the story. Do Russians oblige all their prisoners to become ballerinas? Sarai is still on the hunt. So, will Hadji Murat rescue his son and get revenge? Will he risk awkward pauses over the family dinner table and marry Sarai? Will Nicholas survive his attempt to cheat on his mistress? Watch The White Devil to find out! Let’s start with the good stuff. The White Devil looks and sounds amazing, especially considering the year it was made. As sound films became the norm, many films became static and dull, the wild imagery of the late silents dampened by the primitive sound technology. The White Devil is a silent, of course, but it also makes use of synchronized music and sound effects. I am on record as being a non-fan of most vintage silent film scores. Frankly, they are too high-pitched for the modern ear and get jaunty at the most inappropriate times. The White Devil’s score has the brooding authenticity of its Russian and Caucasian settings. 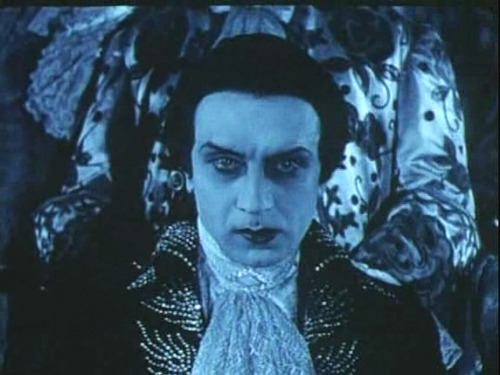 Per the moronic Mordaunt Hall, film critic for the New York Times during most of the silent era, The White Devil was released in the United States with dubbed English vocals. If Hall is to be believed (and even a blind pig sometimes finds a truffle), these alien voices were unintentionally hilarious. So, it sounds good but how does it look? Wow, wow, wow. I mean, you see the screen caps. You can see the moody lighting, the gorgeous costumes and the stern dedication to authenticity. And the direction, while not groundbreaking, is imaginative and quite modern. The whole thing is a brooding, shadowy affair with campfire smoke and candlelight offering relief to the darkness. And Ivan Mosjoukine… Be still my heart! This film makes me glad for the pause button so that I can stop and admire. More intensity, Vanya! That’s it! Beautiful cinematography, great sound… What’s the bad news? Well, like so many films before and since, The White Devil completely misses the point that Tolstoy was making. In fact, every imaginative and observant aspect of the story is flipped over in favor of the trite and conventional. I will get into the particulars of this in a bit but let me say that this is shocking for a screenwriter of Alexandre Volkoff’s skill. It could be that Volkoff, a czarist, was uncomfortable with the decidedly critical take on Czar Nicholas I. Conventional role for an unconventional actor. Finally, let’s discuss the performances, specifically, my beloved Ivan Mosjoukine. Well, to be honest, I was a little disappointed. It’s not that he’s bad. Far from it. He’s excellent. It’s just that there is nothing about either the role or the performance that couldn’t be done by any other accomplished actor of the period. You see, Mosjoukine specialized in challenging, complicated characters. When you watch a Mosjoukine movie, you go in expecting to see something that no one else could pull off. So seeing him as a conventional stern heroic type feels anticlimactic. It also fails to make use of his flair for comedy, which is a real shame. Spoiler warning for this paragraph: That being said, Hadji Murat’s operatic fifteen minute death scene is so good that it almost redeemed the entire film. We get everything: a fight to the death, an “I’m dying on my feet” moment, a too-late rescue, tearful farewells to almost every major character and then a final stylized collapse. Such a scene could have so easily been maudlin or tedious or descend into bathos but Mosjoukine does what he does best and he pulls it off. The supporting roles are a mixed bag. Asphalt allowed Betty Amann to sink her teeth into both her juicy character and Gustav Fröhlich. In The White Devil, Sarai is utterly damseled for much of the picture. The narrative contortions required to send her character to St. Petersburg seem to throw Amann off balance and she never really finds her footing. This is particularly irritating since we all know Amann is a good actress when she has good material. It is also uncharacteristic for Volkoff and Mosjoukine as both tended to prefer strong, independent heroines in their productions. Lil Dagover steals the show. Lil Dagover fares much better as Nelidova. The influential mistress of the czar is played with a knowing wink. Nicholas may think that he is in charge but he only has the title. Nelidova has the brains, the cunning and she wears the pants in the relationship. It’s the better of the two main female roles and Dagover clearly knows it. Nelidova’s smarts and her mischievous sense of humor comes across loud and clear. Frankly, she should have been the main character. He plays a great creep. Fritz Alberti is truly excellent as Czar Nicholas I. He properly conveys the metal gymnastics of a man who is not half as clever as he thinks he is. His childish antics made me doubly regret that he and Dagover were not present for the entire film. It would have been a marvelously saucy court dramedy, I think. Acho Chakatouny does well enough as Shamil but the decision to make his character heroic is another mistake made by the screenwriters. Hadji Murat had made it clear that Shamil was just as despotic and corrupt as Nicholas and the contrast between the two not-as-smart-as-they-think-they-are men was a central theme of the novella. The screenplay abandons this contrast in favor of more conventional story elements. Alberti’s fine acting is wasted when Nicholas is turned into your standard cartoon villain threatening Sarai with A Fate Worse Than Death™. Hadji Murat saves her of course and then he returns to the Caucasus to have it out with Shamil and the czar does not pursue the matter. Great acting to no purpose. So… there was no point to the whole St. Petersburg episode, was there? I wouldn’t mind so much except that the screenwriters moved heaven and earth and twisted and turned in order to get everyone there. If they had just kept the action in Tiflis, it would have saved all sorts of time that could have been used on giving Sarai a personality or something. Darn you for being just too heroic and awesome! But I want to talk more about Imam Shamil. In the novella, the bad blood between Shamil and Hadji Murat is a complicated blend of old feuds and succession debates. Hadji Murat is the more noble of the two but he wants power and he is willing to do a lot in order to get it. The White Devil makes their antagonism the result of Hadji Murat being just too darn heroic. Once again, depth is sacrificed for conventionality. Tolstoy specifically stated that Hadji Murat did kill prisoners (war is war) and he was capable of brutality, though he does have a strong sense of honor. Still, he leaves a trail of bodies wherever he goes, which makes the character ambiguous to say the least. Hadji Murat of the book was charismatic and intriguing but he can’t really be described as a hero. The fact is that Hadji Murat is not really suitable as a feature-length film. It really needs to be a miniseries. Most translations run around 120 pages but the pages are densely packed without a shred of fat. The story has dozens of characters, each with their own agenda and backstory, and Hadji Murat is not actually center stage throughout most of the novella. Rather, characters are reacting to his actions. They made a few changes. The White Devil is drop-dead gorgeous to look at and the acting has much to recommend it but the conventional plot and lack of a driving narrative make it fall short of the earlier work of both director and star. Still, even second-rate Volkoff-Mosjoukine is a great deal better than what most filmmakers managed. We’re used to “excellent” and “masterpiece” from these guys and so “very good” is inevitably disappointing. The White Devil is a valuable look at Russian émigré filmmaking in Germany but it falls short of being either excellent or a masterpiece. Still, it’s a solid, well-made film and is definitely worth seeking out. There are blurry public domain versions of this film floating around the internet but no major silent film concern has released in high-quality format. This is a pity as the movie’s biggest pluses, its cinematography and costuming, are spoiled somewhat by the blurry picture. Given the controversial subject matter, it’s amazing that any adaptations of Hadji Murat made it to the screen. At one point, the novella was outright banned as a subject for film in the Soviet Union. However, Hadji Murat’s journey to the movies was not over. Peplum. Hoo boy, peplum. For those of you unfamiliar, it refers to the mid-century sword and sandal flicks made in Italy. American bodybuilder Steve Reeves was the king of this curious genre, taking advantage of the fact that Italian films were shot silent and voices were dubbed in post-production. No Italian? No problem! You could still be an Italian movie star. Sword and sandal film is a hit-or-miss thing for me. Some of my favorite so-bad-they’re-good films fall in this genre but others get so bogged down in blood and bikinis that they become tedious. The White Warrior isn’t a completely peplum affair but it has leanings. The Italians teamed with the Yugoslavians and tried their hand at Tolstoy’s Hadji Murat with the 1959 Steve Reeves flick Agi Murad, il diavolo bianco, released in the United States in 1961 as The White Warrior. To be honest, I wasn’t going to cover The White Warrior beyond a brief note in the review text. However, this review has been pretty heavy and I think we all need a break. So what the heck! Let’s do this. Let’s pit Steve Reeves against Ivan Mosjoukine. There will surely never be another opportunity to do so. We will crush the rebels with diplomacy and low-cut tops! The most popular leader of the rebels is the dashing Hadji Murat (Steve Reeves), a musclebound hunk of strategic and tactical genius. The czar wants to use negotiation to win the Caucasus over to their side and so he orders the officers on the frontier to use diplomacy. The Russians decide the best way to handle this is to shoot and stab Mr. Reeves a little and kidnap him. Then he will be their friend! If you see flaws in this glorious plan, you clearly do not deserve the czar’s commission. Diplomacy. I do not think it means what you think it means. That voice… where have I heard that voice? Hadji Murat’s capture causes all sorts of trouble for his new wife, Sultanet (Giorgia Moll) and his young son. They are faced with death and/or dishonor but I was distracted by something else. The voices for the women and Hadji Murat’s young son, they seemed so… familiar. Most of the film is spent with the villainous Prince Sergei Vorontzov (Gerard Herter) doing a “you must pay the rent, I can’t pay the rent” routine with the captive Hadji Murat. Herter overacts outrageously while Reeves manages to get through these scenes with a straight face, which did impress me a bit. No one’s getting an Oscar here. The White Warrior does all right for what it is but it’s hardly the most exciting film. A lot of time is spent talking about this and that but the action is grudgingly eked out. Oh well, at least viewers can play Spot June Foray to pass the time. Another thing Tolstoy never thought of. As expected, this version takes outrageous liberties with Tolstoy’s text. Hadji Murat totally saves Chechnya from Russian rule (history!) and rumors of his death are greatly exaggerated as all ends in wine and song. The whole thing is unintentionally hilarious and I do recommend it for fans of chee-zee cinema but not for fans of Tolstoy. But I’m pretty sure that’s stating the obvious. We all need a little cheese in our lives. No surprises here. It wasn’t a fair fight but life isn’t fair. The White Warrior is a clunky film with no sense of pacing. The White Devil had its problems but there were no issues with the basic craft of moviemaking. As for the leading men, Steve Reeves is a sinewy block of wood. While Mosjoukine is not at his best in The White Devil, there is still no competition in the acting department. Or the directing. Or even the writing. That’s not to say that The White Warrior is without its charms. In addition to the Rocky and Bullwinkle connection, we are treated to the least Russian Russians and the least Chechen Chechens ever to grace the screen. I can see this film being a blast watched MST3K-style with a group of friends. Availability: There are lots of public domain and bargain releases for The White Warrior, all of them the cut down American release as far as I can tell. If you want to plunk down money for the thing, you may as well snag the Warriors 50 Movie Pack Collection , which gives you fifty sword and sandal movies for the price of a single movie theater ticket. This post was my contribution to the Fabulous Films of the 30s Blogathon hosted by the CMBA. Be sure to read the posts and do check out the tie-in book that some of the other participants put together . All proceeds will be donated to film preservation. Great stuff! I wouldn’t even be aware of the Russians-exiled-in-Paris-film-community if not for your blog. It’s interesting to learn about the advantages of working without sync sound, and the accomplishments of that era. I understand that silent film lasted even longer in Japan – the only late-period silent I know from there is Ozu’s “I Was Born, But…” (1932), though I suspect there are many others of interest from the period. Ozu made his last silent film in 1936, in fact! I agree with the previous commenter re: Russian filmmakers in Paris. This is something I’m going to learn more about, thanks to your fab blog. However, the silent film sounds marvellous, and it’s too bad there are only blurry copies available…. which is better than none, I guess? I’ll be searching for & bookmarking it. Also, Ivan Mosjoukine seems to have the most intense, piercing gaze, no? So glad to spread the word about my beloved filmmakers in exile! Flicker Alley has a wonderful box set, should you care to learn more. The talkie is actually a scream to watch. I can see a room full of friends and a bottle of white wine making the experience even better. Now I want to watch everything I possibly can with Mosjoukine in it. So far I have only seen Kean (1924). Previous PostPrevious The Shorts Blogathon is this weekend!